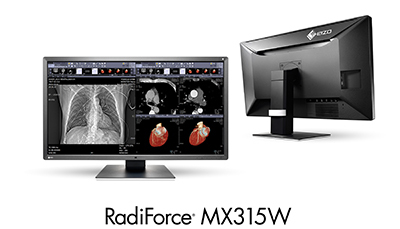 Hakusan, Japan, February 21, 2017 – EIZO Corporation today announced the release of the RadiForce MX315W, an 8 megapixel, 31.1-inch monitor with a slim, lightweight design in EIZO’s line of clinical review monitors. The RadiForce MX315W is the first 8 megapixel monitor in the RadiForce MX Series. With a resolution of 4096 x 2160 pixels over the 31.1-inch screen, a large amount of information can be viewed at once. This allows the monitor to be used in cooperation with various systems such as electronic health record systems, and picture archiving and communication systems (PACS), so that multiple applications and windows can be displayed at once on the same monitor. By utilizing the MX315W’s increased viewing space and freedom of layout, it is possible to display various inspection images side by side, such as CT and MRI images in tiled format. This will allow for the comparison of old and current scans, ultimately improving efficiency. The MX315W also offers the highest brightness in the RadiForce MX Series at 450 cd/m2. EIZO guarantees 5 years or 10,000 hours of use at the recommended 270 cd/m2 brightness level, ensuring optimal brightness stability over a long period of use. A built-in brightness-sensor ensures the brightness of the monitor will stay consistent over time. Additionally the monitor supports DICOM Part 14* standard calibration. The monitor has a new slim design to minimize clutter at the workspace. It is only 225 mm deep and 11.7 kg in weight, meaning that less space is used and installation is a breeze. Furthermore the monitor has a built-in power supply so the workspace is free of bulky power supply bricks. EIZO will be demonstrating the RadiForce MX315W at the European Society of Radiology 2017 (ECR 2017) from March 2 – 5 in Vienna, Austria. The RadiForce MX315W will begin shipping in June, 2017. Date of availability varies by country so contact the EIZO group company or distributor in your country for details.